This the story about the Country Bears, and in particular the Holiday Hoedown show. I give some insights into the attraction, and play the audio for you. The show ran from 1984 until about 2000, and was a bit of fun. The entire building was redecorated, and the bears were wearing holiday costumes. And the script and songs were different. It was kind of fun to get into the holiday spirit. For me personally, it was always fun to try and time a visit so I could catch the show, since it had a limited run. Back in 1992, when I was a CastMember, I had the pleasure of working over the holidays. This podcast is a story about that time, and in particular my experience on New Year's eve. It was a really fun time, and I still remember it fondly - so I thought I'd share the story. The holidays are back! 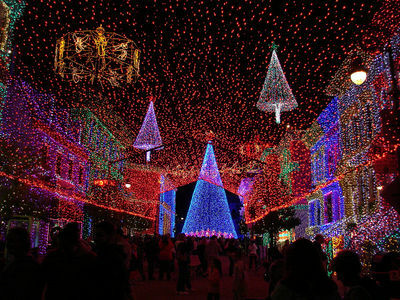 The decorations are back at the Walt Disney World resort, and the fun begins. Join me as I welcome Curt to the podcast. We talk about some of the fun things you can do while at the resort. Sure there's Mickey's Very Merry Christmas Party, but there are plenty of other things to do and see - from stories at each country at Epcot, to decorations at the various resorts, to the Osborne Family Lights. Come along and listen to some of the things you can enjoy. DDV #77 - News from around "the world"
This podcast is News from around WDW, including info about the FantasyLand expansion in the Magic Kingdom, Epcot's new park entry system using RFID technology, and changes at the Animal Kingdom. Plus some news from D23, a quick look at the new Muppet Movie, and a final update on the monorail accident. The NTSB's final report on the Monorail accident is can be found on the NTSB website. During the discussion, I quote "a blogger"...his work can be found here.